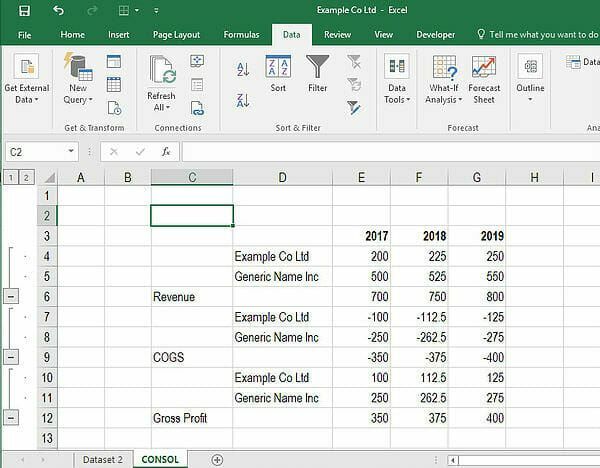 The consolidate function in ExcelExcel DefinitionExcel definition: software program by Microsoft that uses spreadsheets to organize numbers and data with formulas and functions. Excel analysis is ubiquitous around the world and used by businesses of all sizes to perform financial analysis. allows an analyst to combine information from multiple workbooks into one place. 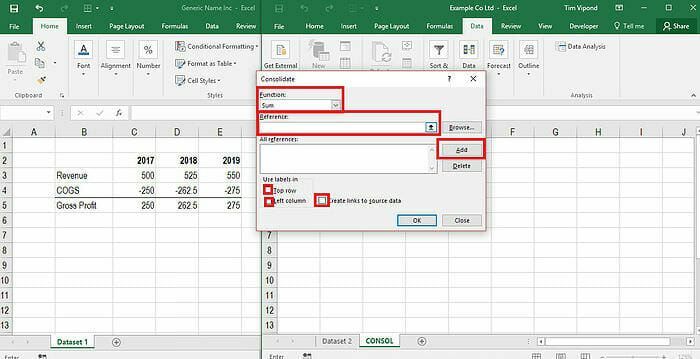 The Excel consolidate function lets you select data from its various locations and creates a table to summarize the information for you. We’ve created a step by step guide to help you create your own consolidation by combining similarly organized data across multiple sheets and books. Step 1: Open all files (workbooks) that contain the data you want to consolidate. Step 2: Ensure the data is organized in the same way (see example below). Step 3: On the Data ribbons select Data Tools and then Consolidate. Step 4: Select the method of consolidation (in our example, it’s Sum). Step 7: Check boxes “top row”, “left column”, and “create links to data source” (note you don’t have to tick these boxes if you don’t want labels or don’t want live links) and click the OK button. Why use the data consolidation function? There are many reasons a financial analyst may want to use the Excel consolidate function. One example would be combining budgets from various departments into one company-wide budget. This may be common for an analyst or manager working in financial planning and analysisFP&A AnalystBecome an FP&A Analyst at a corporation. We outline the salary, skills, personality, and training you need for FP&A jobs and a successful finance career. FP&A analysts, managers, and directors are responsible for providing executives with the analysis, information they need to make operational, strategic decisions (FP&A) or other accounting functions. What if the data sources have different items? The Excel consolidate function will still work if there are different labels in the left column. The key is to use labels carefully and ensure they are the same in each table (e.g., if you have a spelling mistake, or slightly different version of the label, it will treat them as separate). 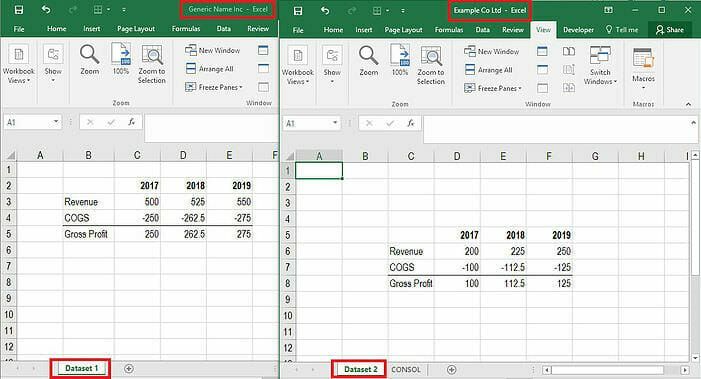 Excel formulas listExcel Formulas Cheat SheetCFI's Excel formulas cheat sheet will give you all the most important formulas to perform financial analysis and modeling in Excel spreadsheets. If you want to become a master of Excel financial analysis and an expert on building financial models then you've come to the right place.